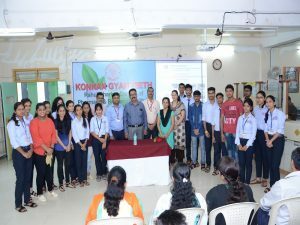 “K.G.Sanjeevani: Patient counselling, Education & Awareness” on 9th July 2018. The program started with lightening of the lamp and Saraswati Poojan by the hands of Dr. M. K. Kale, Principal Dr. Prabhakar Shirodkar Research Director. 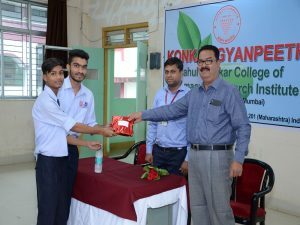 Mr.Vivek Joshi Pharmacist Karjat was guest of honor for this programme. Students from first to final year were done Patient counseling in various region like Badlapur, Karjat, Panvel, Kalyan and Khopoli. Mr. Sanjay Choudhari for Kalyan ,Mrs.Revati Deshpande for Karjat , Mrs.Mamata Patankar for Khopoli ,Mr.Vikas Phirke for Badlapur, Mr.Pravin Naik for Panvel were co-ordinator for this programme..Aditya Pisal and Prutha Parmar were shared their experiences during Patient counseling. 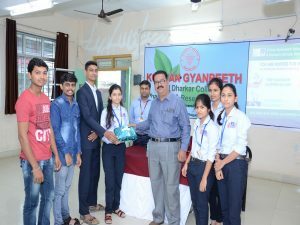 All participated students in K.G.Sanjeevani were congratulated by flower bookie and gift as token of love from college. Mr.Pravin Naik was convener for this event. Vote of thanks has given by Mr. Pravin Jagtap.